INDUSTRYNEWS Buy the best commercial and residential controls direct from the manufacturer Since 1969 our goal has been excellent customer service with personal attention to your order 2 BXL 3 BXL New Products Stocked at FlexiForce Dixon Facility FlexiForce announces the addition of Struts, Track and Perforated Angle to the list of items stocked at the Dixon, Illinois facility. 2" track is available in either Dura-Hem or conventional track profi les. FlexiForce acquired Helton Industries in May 2012. "Since the acquisition, we have focused on expanding the breadth of the product offering available from Dixon," said Mike Rauch, CEO. "We aim to give the same 'one-stop-shop' service in eastern North American as we provide in the west from our Abbotsford BC facility." D-2-3 1 KSMX Custom Controls Available WPS-1 Overhead Door Corporation Selected as a Winner in the 33rd Annual Telly Awards Overhead Door Corporation, has been named a Bronze winner in two categories in the 33rd Annual Telly Awards for its television ad titled "Perfect Day." 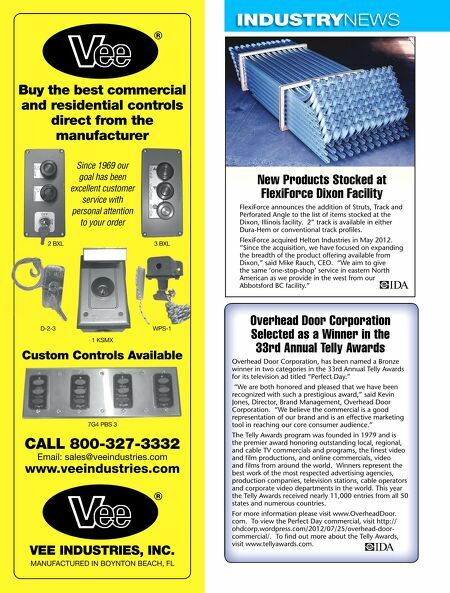 7G4 PBS 3 CALL 800-327-3332 Email: sales@veeindustries.com www.veeindustries.com "We are both honored and pleased that we have been recognized with such a prestigious award," said Kevin Jones, Director, Brand Management, Overhead Door Corporation. "We believe the commercial is a good representation of our brand and is an effective marketing tool in reaching our core consumer audience." The Telly Awards program was founded in 1979 and is the premier award honoring outstanding local, regional, and cable TV commercials and programs, the fi nest video and fi lm productions, and online commercials, video and fi lms from around the world. Winners represent the best work of the most respected advertising agencies, production companies, television stations, cable operators and corporate video departments in the world. This year the Telly Awards received nearly 11,000 entries from all 50 states and numerous countries. VEE INDUSTRIES, INC. MANUFACTURED IN BOYNTON BEACH, FL For more information please visit www.OverheadDoor. com. 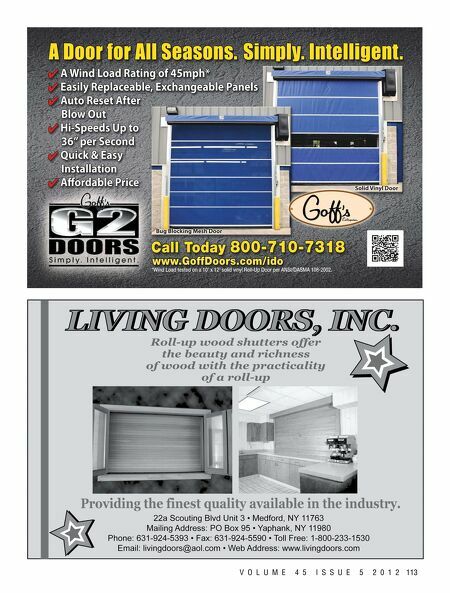 To view the Perfect Day commercial, visit http:// ohdcorp.wordpress.com/2012/07/25/overhead-door- commercial/. To fi nd out more about the Telly Awards, visit www.tellyawards.com.